Desserts are not always on the menu in our busy little corner of the world. Sometimes; however, the need arises for a quick, sweet bite of something. During the holidays, we found ourselves constantly in need of a dish or a dessert for carry-in dinners, gatherings, and events. I would love to make every dish from scratch--but, that's not always doable! 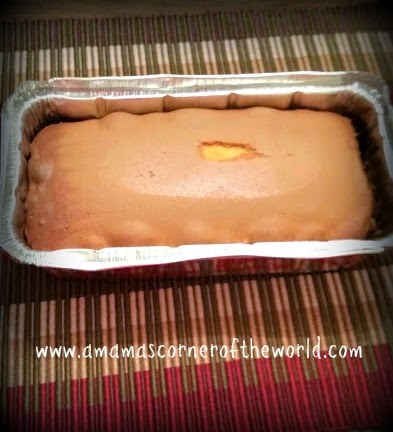 I recently had the opportunity to sample and share a Sara Lee Pound Cake. The thought of a quick, easy and versatile dessert was appealing. 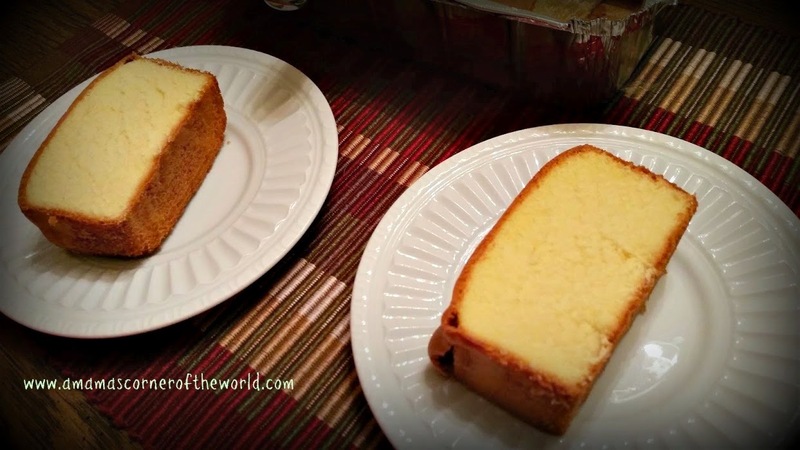 How did Sara Lee Pound Cake stand up to the test in our kitchen? I received a complimentary sample of a standard size Sara Lee Pound Cake of my choice for use in this review via BzzAgent. All opinions and experiences are my own. 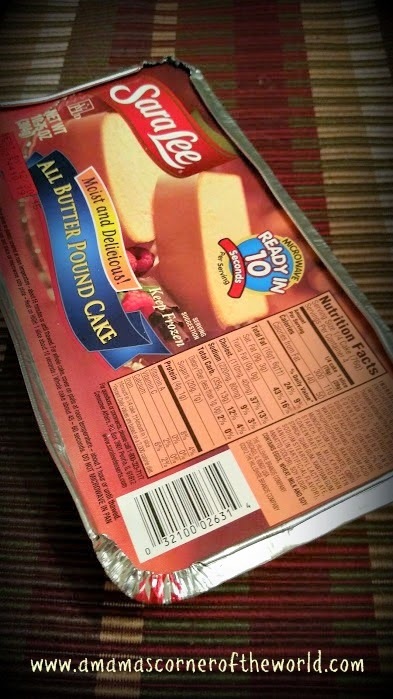 Sara Lee Pound Cakes are sold in the frozen dessert section--and should be kept frozen until ready to use. Rather than defrosting our cake in the microwave, we opted to thaw the Sara Lee Pound Cake the old fashioned way....with a little time on the counter top while we prepared the rest of our meal. There are instructions for thawing printed on the package--and they worked just fine. We lost a little piece of the cake as it stuck to the cardboard of the packaging--but, aside from that little blemish; the cake looked perfect. Our Kroger store did not carry pre-sliced Sara Lee Pound Cakes--and, in fact, only offered the All Butter Pound Cake variety. The package notes that it contains four servings. Since slicing that cake into fourths would make slices a little too large for our little girls, it was cut into 5 slices instead. The slices were still pretty thick! The plain Sara Lee Pound cake had a nice texture and buttery scent. Once the cake was sliced--it was time to face the next dilemma: Eat it plain or get creative with dessert. The girls were ready to make a variety of desserts from the one Sara Lee Pound Cake. 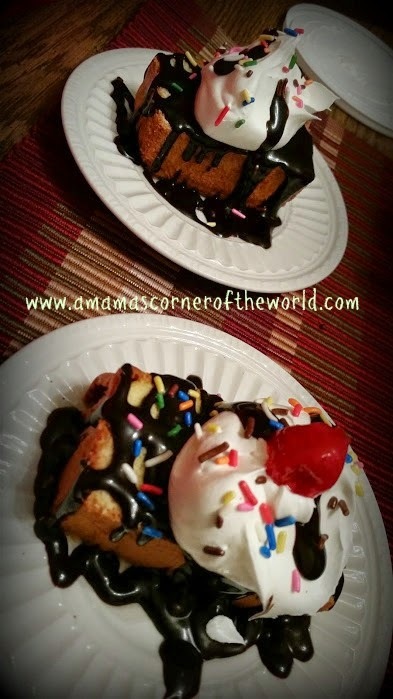 In minutes, the girls drizzled Hershey's Chocolate Sundae Sauce over the Sara Lee Pound Cake. 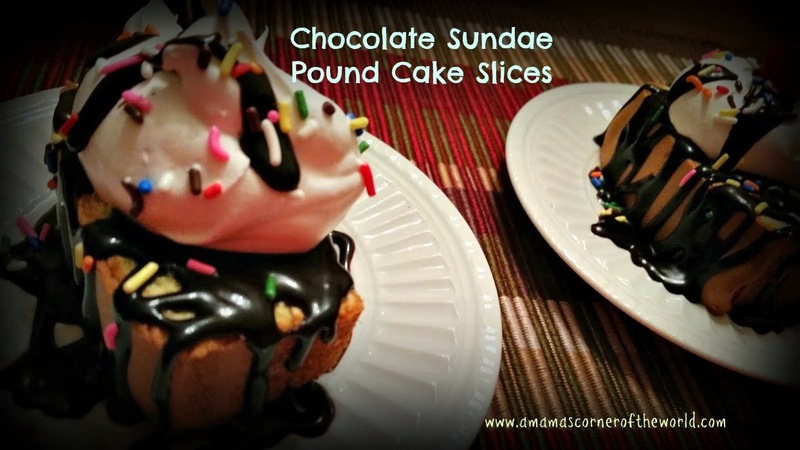 After a spoonful of whipped cream, a dash of candy sprinkles, and a cherry--their Chocolate Sundae inspired pound cake slices emerged. And the cake slices disappeared just as fast as they were prepared. 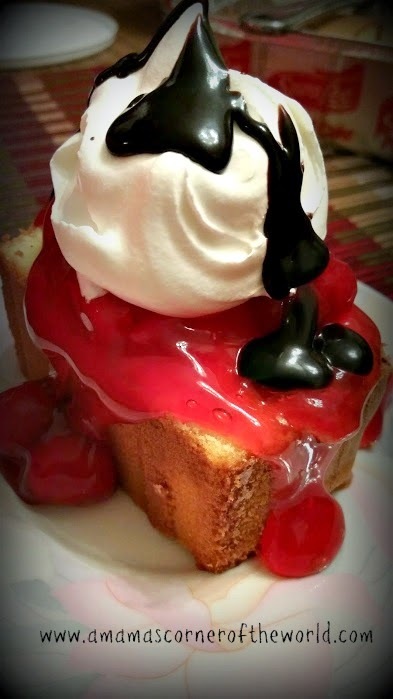 Cherry pie filling, whipped cream--and a little chocolate sundae sauce made a quick and easy dessert. How did the Sara Lee Pound Cake taste? This cake was moist, flavorful, and tasted great for a ready made, frozen dessert. We used a few simple items on hand in our kitchen to customize a few different dessert options (to suit different tastes) from the one cake. The entire family liked the taste, texture, and convenience. 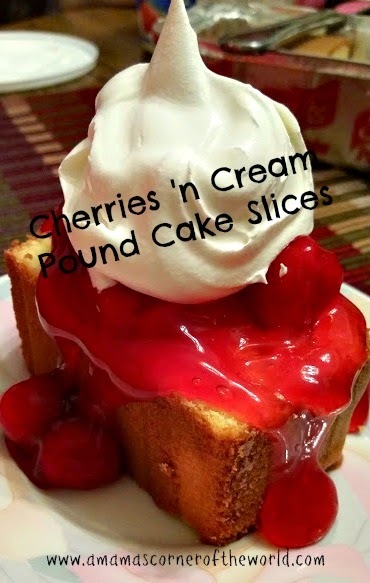 Would I recommend Sara Lee Pound Cake? Yes--it's a processed, frozen dessert cake--but, it's a well done processed, frozen, dessert cake. It's not organic. It's not gluten free. It's not a health food. It's an occasional, convenient, dessert option--that actually tasted good. I would buy this again--in fact, the husband picked up one at the store already to have on hand. I would certainly visit the Sara Lee website for dessert recipe ideas for potlucks and last minute dessert requests. I received a free product sample for use in this review. All opinions and experiences are my own.